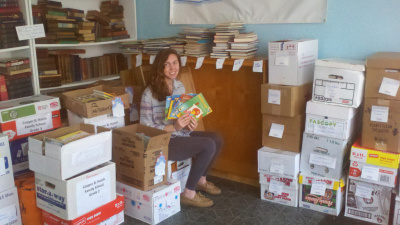 Delaware Youth Volunteerism Award | Back to Basics Learning Dynamics, Inc.
Charter School of Wilmington senior Christine McNeill collect books for the Delaware based literacy non-profit Success Won’t Wait. Nominations for the Governor’s Outstanding Youth Volunteer Service Awards are now being accepted by the State Office of Volunteerism. This is a wonderful way to recognize the impact Delaware’s youth volunteers, 18 and younger, have through community service. Award recipients will be honored at a special ceremony on May 19, 2016 at Polytech Adult Education Conference Center. Individuals and groups volunteering in the following service categories will be chosen; Arts/Culture, Community Service, Education, Environment, Health and Special Needs, Human Needs, Public Safety, Social Justice/Advocacy. Nominees must have volunteered the hours during the 2015-2015 school calendar year. Nomination packets must be delivered to the State Office of Volunteerism by Friday, April 8, 2016. These awards are a wonderful way to capture and highlight all the ways our young people are contributing and giving back to Delaware. Winners receive a framed certificate and picture of them accepting the award. Winners and their organizations are highlighted in press releases and social media. or by calling her at 302-857-5006. Tell us how we’re doing and share your Back to Basics story! Everything you ever wanted to know about the ACT college admissions test!